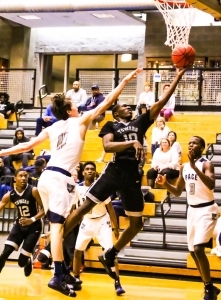 Five more DeKalb County high school basketball teams clinched 2019 state basketball playoff berths with victories in region tournament action on Tuesday night. 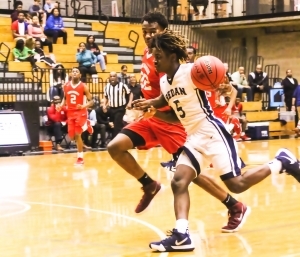 The Redan Raiders earned a second consecutive trip to the state playoffs with a 60-47 win over the rival Stone Mountain Pirates on Tuesday night at Pace Academy in the Region 5-5A first round. Stone Mountain’s Samari Moore hit an old fashioned three-point play with 2:24 to play as the Pirates (14-11) pulled within 52-45. Redan would go on to hit eight of 10 free throws in the final 1:36 of the game to seal the win, including Javen Flowers-Smith four consecutive makes at the line. Siah Gray gave the Raiders (13-12) a 37-25 lead with a pair of free throws as the 4:08 mark of the third quarter. Jevon Rubin’s half court heave at the buzzer pulled the Pirates back within 40-33 heading into the fourth quarter. The Pirates pulled within four (43-39) on a driving layup by Bryson Dennis with 5:22 to play in the game, but would get no closer. Redan would hit 13 of 16 from the line over the final 3:46. Xavier Worthy would hit five of those free throws to go with the four by Flowers-Smith. Flowers-Smith (19 points, 10 rebounds) Redeetris Richardson (16 points, 13 rebounds) both had doubles to lead the Raiders. Bryson Dennis finished with 16 points for Stone Mountain and teammate Jevan Rubin added 13. The Towers Titans battled Top 10 ranked Pace Academy before falling 57-43 to end their season in the first round of the Region 5-3A Boys’ Tournament at Pace. Towers got six second quarter points from Khalil White and took a brief 23-21 lead in the second quarter before going into the half tied at 23-all. George Adams hit for six points in the third quarter for Pace and Josh Reed added five as the Knights pulled out to a 36-29 lead going into the fourth quarter. White came close to knocking down a three-pointer to open the fourth quarter, but the ball just rimmed out as he was fouled. White hit all three free throws to close the gap to 36-32 with 7:21 remaining. Justin Johnson was six of six from the free-throw line in the fourth quarter and added another basket as the Knights (19-7) pulled further ahead in the final period of play. White finished the night with a game-high 14 points to lead the Titans (4-20) as their season came to an end. Madison Durr finished with 13 points and Justin Johnson had 12. Other playoff clinching games came in Region 5-5A at Columbia as the Chamblee Lady Bulldogs and Miller Grove Wolverines punched their tickets to the Class 5A state playoffs. Trinity Edwards scored 28 points for Chamblee (8-17) which defeated Miller Grove (10-15) 52-44 to reach the state playoffs for the third consecutive season under Coach Kurt Koeplin. Miller Grove extended its playoff run to 12 seasons (2008-2019) with a thrilling 60-58 win over the Chamblee Bulldogs (11-14). The Druid Hills Red Devils (18-7) broke their two-game losing streak to Eastside with a 65-53 win over the No. 3 seed in the Region 4-4A Tournament at North Clayton. It will be Druid Hills’ third consecutive trip to the state playoffs. Coach Dennis Watkins Stephenson Lady Jaguars program collected its 19th consecutive trip to the state playoffs with a 47-22 win over Munday’s Mill in the Region 4-6A Tournament at Stephenson on Tuesday night. The Martin Luther King Lions (6-20) season wound up with a 64-49 loss to Mundy’s Mill in first round boys’ action at Stephenson. In Region 7-7A play, both Lakeside teams came up short in their bids for the state tournament. The Lady Vikings (17-9) dropped a heartbreaking 65-60 overtime decision to Central Gwinnett at Meadowcreek. The Vikings (9-18) fell 55-32 to Berkmar to end their season. The Dunwoody Lady Wildcats (10-16) had their season cut short with a 57-46 loss to John’s Creek in the Region 7-6A Tournament at Pope.